As SeaWorld and OSHA continue their backroom and courtroom dealings over what sort of interactions SeaWorld trainers should be allowed to have with SeaWorld’s killer whales, the question of the risks inherent in drywork is central. “Drywork” is when trainers interact with the killer whales on slideouts, stages, and shallow ledges. That is in contrast to waterwork, which is interactions in which trainers are in the pools with the killer whales. SeaWorld stopped performing waterwork after Dawn Brancheau was killed by Tilikum (even though Brancheau was in fact doing drywork according to SeaWorld’s definition). Given the OSHA citations and court rulings so far, it doesn’t seem likely that SeaWorld will feature waterwork again anytime soon. 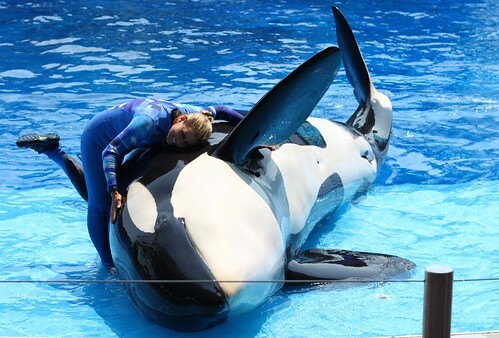 However, SeaWorld, it appears, would like to work out a deal that would modify OSHA’s stipulation that trainers maintain a minimum distance or work from behind a barrier, and allow SeaWorld trainers during shows to have close contact with killer whales when the trainer (and often the killer whale, too) is out of the water on the stage or a slideout. I think that we can stipulate that a trainer in the water with a killer whale is much more vulnerable than a trainer out of the water. But even if that is so, OSHA’s main concern has to be what sort of risks to trainers exist during drywork. OSHA’s expert witness when it faced off against SeaWorld in court in 2011, Dr. David Duffus (who also features in Blackfish) has long been of the view that a killer whale’s speed, power and intelligence means that the risks to trainers are inversely correlated to the distance that exists between a trainer and a killer whale. No distance = higher risk. Greater distance = lower risk. As OSHA ponders how much risk there is in trainers getting close to killer whales, I thought I would ask an expert, John Hargrove, a former SeaWorld senior trainer with long experience at both the SeaWorld California and SeaWorld Texas parks. Another time, during a sonogram, Orkid came up out of the water and struck that same trainer as she stood poolside, knocking her over a wall. The trainer landed on her head, and lost consciousness. That incident also ended with the trainer in a hospital. Hargrove added that there have also been incidents in which killer whales in a line-up at the stage have come up out of the water and struck a trainer (SeaWorld requires any instance in which a killer whale comes out at a poolside trainer past its pectoral flippers be reported as an “incident,” regardless of whether the killer whale makes contact with the trainer). Hargrove was used to working close, especially with Takara. To illustrate this point, Hargrove told me a story, from his SeaWorld California days. Following a show in which he had performed waterwork with Corky, and after the whales had been gated into the back pools, Hargrove and Amy Peters (another trainer and sister of Ken Peters of Kasatka fame) decided to go back out to one of the partially submerged slideovers between the show pool and the back pools to cool off. As they were relaxing, Ken Peters told them he was going to bring Corky and Splash back out into the front pool. For safety, Hargrove and Amy started to stand up to leave, but Ken told them it was okay for them to stay since that would help desensitize Corky and Splash further to the presence of trainers around the pool. Peters pointed Corky and Splash into the show pool, they swam past Hargrove and Amy, and chinned up perfectly at the stage, where Ken met them. Suddenly, Hargrove and Amy saw Corky split from the stage. They immediately reacted, jumping to their feet to get off the slideover. It was just three quick steps to safety. But the 8200 pound Corky was way too fast. Hargrove says he had barely taken one step when Corky shot up onto the slideover between him and Amy, flicked her head and turned her body to corral Hargrove, and slid back into the water pulling Hargrove with her. Hargrove stayed calm and gave Corky a neutral response. Ken Peters immediately started an emergency recall, while Corky–her rostrum against Hargrove’s chest–pushed Hargrove around the perimeter of the pool. Eventually, she responded to the call back and left him. Hargrove says Corky never had her mouth open. But “for a whale to do something like that you have to call it aggressive, taking possession of a trainer is not okay,” Hargrove says. “She went and got me and seized me.” [Interesting OSHA/SeaWorld postscript: this incident with Corky was never recorded in a formal SeaWorld incident report]. Hargrove is a pretty cool customer, but he admits that the incident unnerved him. And the thing that sticks with him is the mindblowing speed a killer whale is capable of. “What you see in the show is nothing to how fast they are when they are pissed, or really want something. It’s really belittling because you see how insignificant you are. To think you are physically quick enough and strong enough in comparison to them is a mistake,” he says. Following that incident, Hargrove once heard a young, overconfident, trainer claim that if he fell in the pool he would be able to climb out before a killer whale elsewhere in the pool could get to him. Hargrove pulled him aside, and set him straight in no uncertain terms. This underscores something I have always believed. There really is no way to make killer whale training completely safe. You need to have enough respect for the supreme capabilities of an amazing animal to say that, depending on how you choose to interact with a killer whale, there is more risk and there is less risk. What there isn’t is no risk. Kind of ironic they say “drywork” is less risk and safe, and 18″ is safe, when that’s the kind of proximity that got Dawn Brancheau killed. They aren’t accepting the fact that killer whales in captivity go crazy, and when that happens, anything can happen short of a trainer being far away from the animal. Arguably the most interesting part of this post is that fact that this incident was never recorded into the Sea World log. Most people, especially most former trainers, would agree that this was certainly a qualifying event. Dry work is definitely safer than waterwork, but as John points out, orcas are quick, smart and capable, wet or dry. While this debate regarding trainer safety is interesting and obviously relevant my primary interest is Orca welfare. The fact of the matter is these Orcas are in captivity, they are at SeaWorld (the ethics of which is an entirely separate issue). Whether or not trainers are ‘safe’ around them to me is a ridiculous question – of course they aren’t! Anymore than you’d be ‘safe’ around a Hippo or an Elephant. Surely the real issue is; how much physical contact by is required trainers in order for not only the physical, but also the mental and emotional health of these animals? Spot on. I plan to look at that question shortly. Reblogged this on Mushmallow Reviews. I’m getting very frustrated that in all this, everything is about the risks to humans interacting with cetaceans with little said about the risks to the mental and physical health of the whales being made to perform. I understand the case centres around specific incidences but I seriously hope a great deal more attention is brought to the fore about captivity in general in the next few days, with any luck leading to a national, if not, international review of the practice. Beverley: It’s a fair point. And just wanted to let you know that the impact of OSHA restrictions on the whales is a topic I plan to explore soon. Never doubted you for a minute! Thanks Tim. Well, OF COURSE there are risks. There are risks in EVERY job working with animals. OSHA should get some sense and leave SeaWorld alone. You seem to completely ignore SeaWorld’s animal welfare atrocities..